By all indications and comments, President Obama's speech at the DNC Convention might have been the 4th or 5th best speech behind Michelle Obama's, Bill Clinton's and a couple of others. 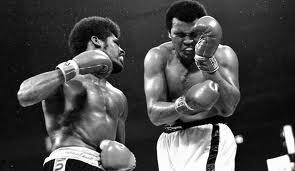 It felt like we were watching Muhammad Ali in one of his last appearances in the ring where his 'Ali Shuffle' didn't 'shuffle' like when he was a fresh new face on the world boxing scene and his 'Rope-A-Dope' strategy only wore himself out, not George Foreman or his opponents. We think it is sort of hard to issue soaring rhetoric for the future when there are 23 million Americans unemployed or underemployed. Perhaps President Obama got an advance peek at the jobs numbers that are going to be announced this morning at 8:30 am and he was depressed by what he saw. These have been troubled times we have all come through over these past 4 years as I have served as your President. I have to admit, just like every other person before me who has run eagerly for this vaunted office in the history of the American Republic, that the job has been far more difficult than anyone can ever imagine. I wish I had not lusted so to attain this high position as the leader of the free world and our free nation before getting more experience in national government and yes, in the private sector. I could have, and should have, broadened my scope, my understanding of how the free market works and my contacts and friendships across political lines before running for this sacred office. Running for President is easy compared to governing as your Chief Executive who takes his orders from the Congress and Senate that you elect every other year. Those Founders...they were truly brilliant men to have set up such a wonderful delicate balance of power in our representative democracy. I stand at awe at what they gave us. I believe we have a bright future ahead of us. We always do as long as we Americans have and cherish freedom, justice and charity towards all as Lincoln reminded us in his Second Inaugural Address right before the Civil War ended and a senseless, cowardly assassin took his life away from us all. I want to lead you again if you will have me as your leader. 'Mistakes? I've made a few' as the song goes. I have learned on the job, just as my predecessors have learned on the job through good times and bad. The most important thing I have learned over these past four years? Leadership comes from the top. I am not just the leader of the Democratic Party in America or the progressive movement but the leader of the free nation of the United States of America and I always want that to be so for our children and our children's children. By the time the Republicans took back control of the House in 2010, I had already poisoned the well with them so much that if I were them, I wouldn't have wanted to work with myself either for the last 2 years! Now, the greatest problem we face today is our growing national debt fueled by explosive annual deficits and spending. Today, I am pledging to you, the American people, that I will sign the Bowles-Simpson Deficit Reduction Commission recommendations the day Congress sends it to my office. I am no longer going to listen to David Axelrod and David Plouffe and Valerie Jarrett who have been insisting that I not touch those common-sense recommendations with a 20-foot pole. Well, I am the President you all elected in 2008...and they are not. They are my friends and advisors and that is it. Once we settle the financial markets and give them confidence that we are actually acting like mature adults and taking bold constructive actions to address the imbalances in our national budget structure, I hope my Republican friends and not-yet friends will work with me and my Democratic brethren to deal with the whole host of other problems we have not dealt with yet in full: entitlement reform; tax reform; enacting a self-sustaining energy policy; completely reforming and improving our national public education systems and yes, revisiting Obamacare so that it can serve as a base to provide health care access to everyone without breaking the fiscal piggy bank of our children and grandchildren. I am not going to promise to you in soaring rhetoric tonight to write checks we can not cash, to issue proclamations that have no bearing on problems we all face together as a nation. I have learned my lesson. I promise to do better for all people in this nation, not just the African-Americans in America or the Latinos in America or the Asians or the poor or the left or the right in America but for all Americans. I ask for your forgiveness for where I have failed in the past. And I ask for your vote of confidence and trust as we face the future and win on every single problem we face. Senator Edward Everett, who gave the 2-hour elegy at Gettysburg as the featured speaker before Lincoln delivered his 3 minute masterpiece in 1863, would have been proud of President Obama last night had he delivered the speech above. President Lincoln supposedly remarked to Senator Everett when he sat down after giving his Gettysburg Address: 'Well, that might not be remembered much by history'. Senator Everett wrote a letter the next day to Lincoln that read: "I should be glad if I could flatter myself that I came as near to the central idea of the occasion, in two hours, as you did in two minutes." Lincoln replied that he was glad to know the speech was not a "total failure". President Obama had the chance last night to change the discourse and the tone of this campaign and set a new course for this nation. It remains to be seen if he will take it.